Officials in the historic Italian town of Pisa have shocked the world by admitting that their iconic tower is in fact not leaning at all. The revelation was made after queries following the 'Euro-Level 2007' exhibition at the town's convention centre. “We had the finest spirit level manufacturers from all over the world with stands at the exhibition and many of them simply could not get their stands set-up squarely”, said Pierre Facturations-Valeer a member of a French delegation. Delegates at the convention reported that those stands with a view of the famous 'leaning' tower were unable to be set level on the convention centre floor. This led to an impromptu survey of the town by delegates and a report to the then mayor of Pisa, Jarno Valore di Fatturazioni. 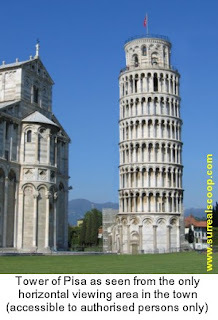 The mayor has now admitted that it is the town of Pisa rather than the famous tower that is sloping. “For centuries we have maintained this horrible secret, but in many ways it is a relief that the truth has come out.” said Signore Valore di Fatturazioni. The former mayor revealed that a secret religious order, known as 'The Inclinati' have infiltrated the world’s scientific and construction communities to spread their inclinations and ensure that all building works within view of the famous tower are constructed at a 5.5 degree angle. This gives the impression to bystanders that it is in fact the tower that is leaning. Signore Valore di Fatturazioni also revealed that the formerly secret Inclinati were launching a travel company for visitors who wish to “Tour the Leaning Town of Pisa”. The town council has come under criticism regarding the large amounts of money that has been spent by both the Italian and European authorities to supposedly stabilising a monument that in fact is in no danger at all of falling. All these secret groups within the church: Opus Dei, Illuminati and now Inclinati. A very sorry state of affairs indeed. I feel so indian right now with my curry ! I feel violated that I have been lied to about this stupid tower. i have been to this sorry excuse for a tourist destination. I bet that's why they did this scam; to swindle good people of a quick buck, am I wrong? These people need to BURN! They cannot be allowed to live and breathe on this earth if they will commit atrocities such as this. This needs to be dealt with, and fast!